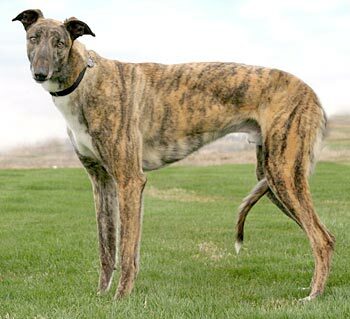 McGregor, aka McGregor Drive, is a handsome, 2-year-old brindle male born February 8, 2008. His sire is TNT Star Wars, making his grand-sire the late, famous, Irish-bred Fortress, and his dam is DC’s What For. McGregor and Glock are siblings, and they both came to GALT from a farm closing. There are no races to McGregor’s credit on Greyhound-Data.com. 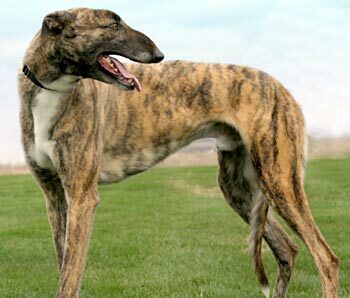 McGregor sports a very unusual feature - a Roman nose, which is somewhat rare in the greyhound world. McGregor is cat tolerant, but has not yet been tested with small animals. McGregor is a large boy with a most exquisite Roman nose. He’s very handsome and quite distinctive. He’s a naturally confident boy. Because he’s so willing to follow his people, and bonds so quickly with his caretakers, I think he would make an excellent first dog. With McGregor, what you see is what you get – a big, affectionate, loving, gentle dog. 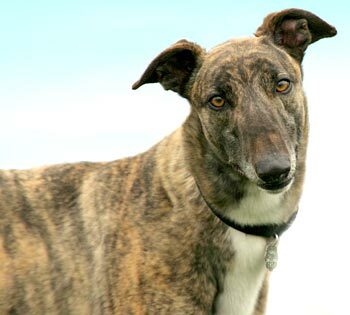 McGregor is a very people-oriented dog - he's the cuddliest greyhound we've ever seen. He will put his head in your lap and under your arm for attention, and will readily push through a pile of dogs to be first in line for petting. He is more motivated by affection than by food. He's always excited to meet new people, and we've been working on curbing his enthusiasm for meeting them by jumping up. McGregor is a very gentle natured dog and gets along well with all sizes of dogs and is respectful of the cats. McGregor acclimated very quickly to being in a home. His house training is going very well - he hasn't had an accident in several weeks now. McGregor responds well to correction. He has free roam of the house while we are away, but he stays muzzled just to be sure the cats will be safe. McGregor is a strong boy, and likes to lead on walks. So we're training him to follow our lead instead by using a head-collar that prevents pulling on the leash. He loves to go for walks, as well as car rides. He'll usually lay down for a nap in the car. McGregor is very playful and loves stuffies with or without squeakers. He can amuse himself for hours throwing them up in the air, “chasing” them through the house, cuddling with them until he naps, then waking up and starting all over. He’s hysterical to watch because he makes up the rules to his game as he goes along. He picks 3-4 favorite toys and rotates through them. He’s starting to run around the yard with our dogs when he goes outside. He will chase toys outside if you throw them for him. I think he would enjoy jogging short distances with his humans as well. The person or family who adopts McGregor is in for a lot of affection from a handsome and very special boy. I’ve learned that all greyhounds are special, but McGregor is an extra special greyhound! He will be a very loving and loyal companion who happens to have a very unique nose.